We have been developing a pipeline to build gene models using only RNA-seq data. For release 58 we have added a preliminary set of Zebrafish RNA-seq gene models with an intention to integrate this new source of evidence into a full genebuild soon. Zebrafish transcriptome data from 9 tissues were used to build a set of genes and splice variants. For each loci we chose the variant with the highest read support to display, further details on the process are available here. 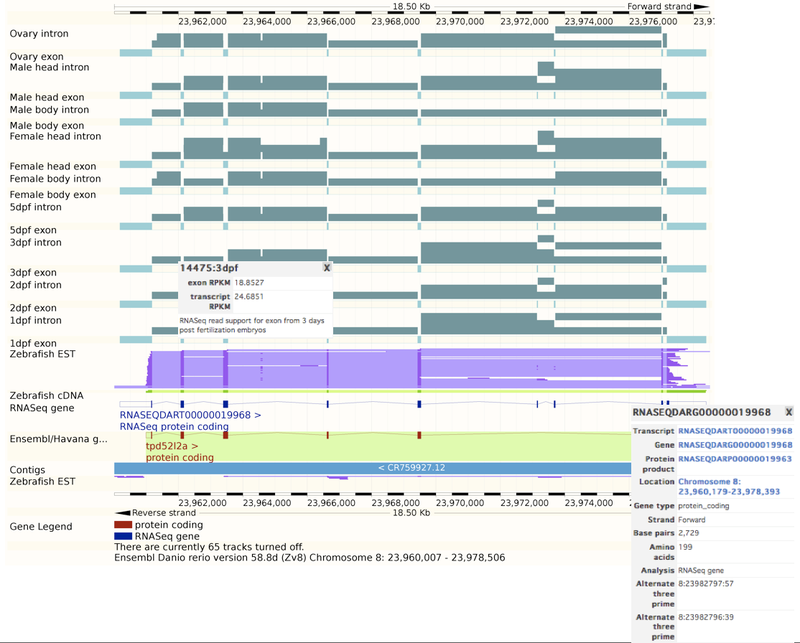 To display the genes, go to the Region in Detail, or Region Overview. Use the “Configure this page” button and select “RNASeq Genes” from the “Genes” menu. The “Supporting DNA Alignments” menu contains supporting exon and intron features from each of the nine tissues. Clicking on these features in Ensembl location pages shows a simple read count for the intron features and RPKM values for transcripts and exons, (reads per kilobase of model per million mapped reads, from Mortazavi Nature Methods 2008). This is a first attempt at visualising tissue specific read depth and alternative splicing, which we hope to develop further in the future.